RNH is, in cooperation with Atlas Network and ACRE, the Alliance of Conservatives and Reformists in Europe, supporting the republication online by AB (The Public Book Club) of many books relevant to individual and economic freedom. In early 2016 a recent book by RNH Academic Director, Professor Hannes H. Gissurarson, was published, The Icelandic Fisheries: Sustainable and Profitable. 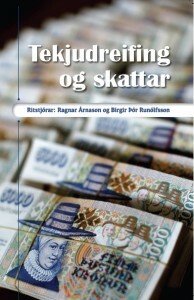 In January 2017, a 2009 book by Professor Gissurarson was made available online, Ahrif skattahaekkana a hagvoxt og lifskjor (Impact of Tax Increases on Economic Growth and Living Standards). In February 2017, a collection of articles, Tekjudreifing og skattar (Income Distribution and Economic Growth), edited by Economics Professors Ragnar Arnason and Birgir Thor Runolfsson, was published. Other authors were economists Arnaldur S. Kristjansson and Axel Hall, Hannes H. Gissurarson and statistician Helgi Tomasson. While the book is in Icelandic, there is a five pages Summary in English at the back. The authors discuss the problems of measuring income distribution (for example by so-called Gini coefficients) and of defining the poverty. Paradoxically, an increase in life expectancy, an earlier retirement age and a longer time spent in school can all lead to income distribution being measured less equal. Two of the conclusions in the book are that poverty, both absolute (in dollars or kronur) and relative (as a proportion of median income), is on the same low level in Iceland as in the other Nordic countries and that income distribution is also similar to that in the other Nordic countries. Professor Arnason submits that the net tax burden (tax payments less government services and benefits) should be considered, and when this is done, the income tax turns out to be much more progressive than usually envisaged. Professor Runolfsson presents the unequivocal results of measuring economic freedom internationally: Everybody, both rich and poor, are better off in the freer economies. Some of the authors discuss the fact that welfare benefits are means-tested in Iceland which can create tax wedges when it does not pay for individuals to increase their work hours because then they lose benefits. These traps have to be abolished without directing benefits to those who do not need them.